I've tried the customer data migration tool on 2 Touchbar MBPs now, and I can't get the storage to be detected on the Mac that I'm working from over USB-C. Does the mainboard HAVE to be removed from the Mac for this to work? You should disconect battery before do enything. Were the Macbooks able to turn on but not see any disk? Then it's probably because the SSD is dead so the tool won't help you. Neither of the machines were powering on at all. 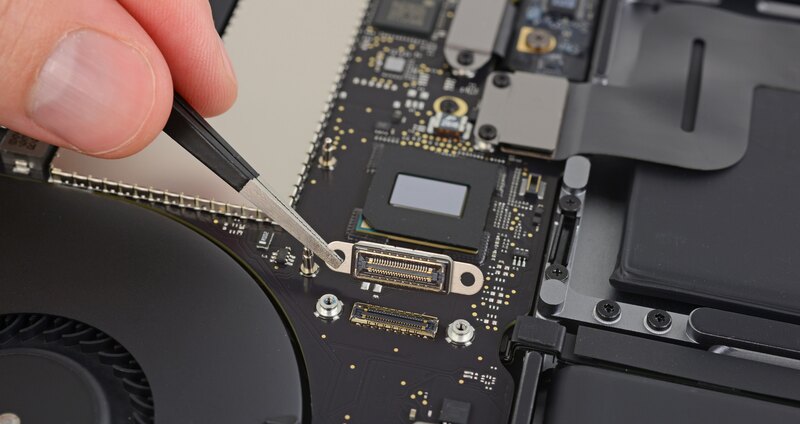 You don't have to remove the mainboard to image the SSD. I believe your other Macbook needs to support Thunderbolt3 though. The adapter/tool is USB-C, where does Thunderbolt come in? I think the older ones are Thunderbolt, but this one is not. ISTM that the onboard SSD should be electrically isolated from the mainboard when it is being accessed by the migration kit. I believe that's what the "plug" does. That is, when the plug is installed, the SSD is connected to the PCIe bus (?) and to the onboard power supplies via 23 shorting links within the plug. Removing the plug breaks all these connections. I'm willing to bet that there will be continuity between each pair of pins on either side of the plug. Moreover, if the SSD's BGA balls are accessible, then it wouldn't be too difficult to trace the pinout back to the plug. "40 Gbit/s speed, PCIe 3.0, HDMI 2.0 LSPCon (DP Protocol Converter), DP 1.2, USB 3.1, 100 W power delivery (compatible with USB Power Delivery) @ 18V, 5.5A"
Yup, that's it. I opened up the one I have to see what was inside too. I've disconnected the battery connector from the Mac's mainboard now, and I've also replaced the cable on the migration tool, it comes with a spare as they only have a limited lifespan. Still nothing, this one two Macs. Either my device is faulty, I'm doing something wrong, or both SSDs are dead. I feel the last option to be the least likely. I've now tried it on a third MacBookPro with touchbar, also nothing. Again, either this tool is faulty, or I'm missing something. Is your other laptop compatible? "The requirements are Both Machines plugged into the device need to have Thunderbolt 3." I purchased this tool some time ago (never used yet) and today I had a A1707 2017 MacBook Pro in for recovery. Looking at the above posts I am guessing I need a Thunderbolt 3 connection to the other Mac so I need to source that first. I do know someone who works with Macs all the time and hopefully I might have some answers for us all soon if he gives me some insights. I can confirm that is a requirement. Is it possible that the USB-C cable is non-compliant? AFAICT the tool requires an active, electronically marked cable. The tool has a USB-C connector on it, and it ships with a Belkin USB-C cable which I've tested and confirmed works. The tool connects USB-C on the tool to USB-C on a functioning Mac. The Mac I'm recovering from, and the one I'm recovering to, don't have Thunderbolt, only USB-C ports. They are A1706 Macbook Pros. Where does Thunderbolt come into it? Oh wait, I see Thunderbolt 3 and USB-C have the same cable. I'm not a 'Mac' person so didn't even think this was a thing. I'm used to Thunderbolt being that odd shaped square-ish connector.
" Although Thunderbolt 3 technology uses USB-C connectors, the MacBook's USB-C port does not support Thunderbolt. Thunderbolt devices, such as storage media and the Apple Thunderbolt Display, are not compatible with the MacBook. Shortly after the MacBook’s introduction, various companies began announcing cables and adapters for the USB-C port." Thanks guys, this must be the issue.